Mikami Shigeru is a video game genius—he can play and conquer any game, and just as easily program his own. While planning his next project, Shigeru discovers a strange oddity among his stack of research materials—a game disc labeled NOT ALIVE. Absorbing into his body, the disc thrusts him into a strange parallel reality where he becomes the “Player” of a real life video game, one where he controls the mysterious and skilled Amamiya Kyouka as his new female avatar. There are a lot of mangas about people entering video games and/or a video game affecting their real life. 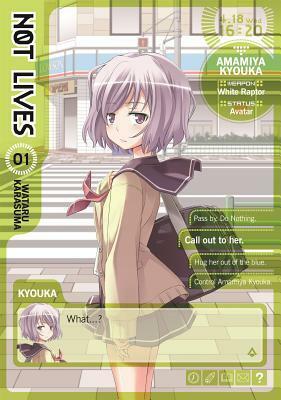 Not Lives is exactly that but the difference is Amamiya isn’t just a game character. She is real life girl, who is stuck in the game until the her controller wins. I found that aspect of this book interesting because as much as it is about Shigeru learning new skills and winning, it is about Amamiya and the history of the game. There is a lot of moving parts and as complicated as they are, you don’t get lost reading it. However, despite the new characters being introduced and the new intense battles, the story itself gets redundant and boring as it is the same ending to every battle and it truly feels as if you are getting no where. Eventually, the story picks up but you are little more than half way through the series before you start to care again. As for Shigeru. . . He wasn’t badly written. He is a coding genius that loves creating video games and wants to be the best at it. Everything he knows and looks for is for video games. There is character growth, which I greatly appreciated because after a while, he begins to get annoying. I have no complaints about the art work as it is detailed and provides variety within the characters. It isn’t as if the art work switches from real life to video game as the game takes place in a real life setting. Overall, I thought it was an alright late night read. If this is your first video game verses real life manga, you will enjoy it.